Abram Dietrich Rempel: church leader and farmer; born 28 September 1889 in the village of Sarona, Crimea, to Dietrich and Katharina (Matthies) Rempel. He was the first of child of four sons and three daughters. In 1912 he married Helene Friesen (30 September 1890 - 1 December 1966). They had ten children, seven of whom survived infancy: four daughters and three sons. Abram died 25 May 1971 in Abbotsford, British Columbia. In early childhood in Abram lived Karasan, Crimea, and moved to the Caucasus in 1898, where his parents began to develop their estate in the Terek District, near the city of Prochladnaya. He attended the village schools and went to Mozdok for his higher education. After their marriage, Abram and Helene moved onto the family estate, where he continued to work. The First World War interrupted their lives. Abram did his alternative service in Yalta, building roads in the mountains of Crimea. During this time their first-born daughter died suddenly. Abram, with millions of others, suffered great losses and faced grave dangers during the revolutionary period. Through the preaching of Johann Toews, Abram converted and was baptized and received into the Mennonite Brethren Church in May 1923. He soon began to preach, which led to persecution, forcing the family to move several times. Two infants died during this time, a daughter and a son. In 1929, with five children, Abram and Helene decided to emigrate. In Moscow, the family waited anxiously for permission to leave Russia, and when this was granted, could only feel safe when they finally passed through the famous gate into Latvia. The further journey brought Abram and his family to Yarrow, BC in 1930. 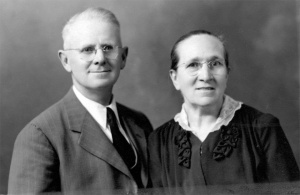 In 1931 Abram settled his family in Abbotsford, where he was instrumental in beginning the South Abbotsford Mennonite Brethren (MB) Church in 1932, and continued as its first leader until 1944. Although he had been ordained for ministry in Russia, Abram’s Canadian ordination took place in Yarrow in 1933, with Johann Harder officiating. He carried the pastoral responsibility with great humility and dedication, while at the same time working hard to provide for his family. Although the church language was German, Abram did his best to learn the English language, but loved the Russian language, and sometimes preached in it. In 1943, the South Abbotsford Bible School, which evolved into Mennonite Brethren Bible Institute, began, and in 1944, the Mennonite Educational School (MEI) had its beginning. Abram Rempel was wholeheartedly involved in both, becoming the first chairman of the MEI board, and serving on the board for a number of years. He favored and supported the working together of Mennonite Brethren and General Conference Mennonites. When the family moved to Matsqui in 1943, and a Mennonite Brethren church was organized there, Abram took on the leadership from 1944 to 1947. He continued to be involved in the church until he had a stroke in 1964. Abram made a partial recovery, and though his body was damaged, his spirit remained strong. As she had done throughout their married life, Helene stood by Abram devotedly and cared for him. She died in 1966. Abram was part of a leadership group whose legacy includes the South Abbotsford Mennonite Brethren Church, Columbia Bible College and the Mennonite Educational Institute, as well as a large God-fearing family. Klassen, Helene. "Rempel, Abram D. (1889-1971)." Global Anabaptist Mennonite Encyclopedia Online. October 2004. Web. 19 Apr 2019. http://gameo.org/index.php?title=Rempel,_Abram_D._(1889-1971)&oldid=142606. Klassen, Helene. (October 2004). Rempel, Abram D. (1889-1971). Global Anabaptist Mennonite Encyclopedia Online. Retrieved 19 April 2019, from http://gameo.org/index.php?title=Rempel,_Abram_D._(1889-1971)&oldid=142606. This page was last modified on 4 January 2017, at 06:02.